Pan control for the 21st century. Choose the frequencies you want to fix and move them anywhere, leaving the rest of the stereo image intact. Make improvements in any area of the sound stage without causing problems elsewhere. Stereoplacer Elements gives you precise control you just can’t get within a traditional mix setup. 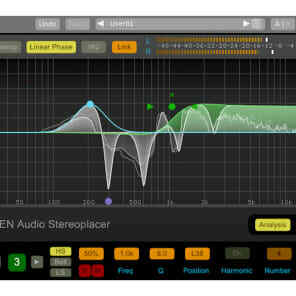 It includes most of the essential features of Stereoplacer, which has become an industry standard for Broadcasters and Mixing/Mastering Engineers. Stereoplacer Elements is an advanced fine-tune parametric balancing control. You can tune each band into specific frequencies and move the frequency content around in the stereo sound stage. Just choose the position you want, and let Stereoplacer take care of preserving the balance of the original sounds. With fully adjustable curves (bell, high and low shelving and even additional linked-harmonic overtones) you can redistribute stereo information with subtlety, or make powerful corrections – even moving hard-panned frequencies from one side to the other without affecting the overall level balance of the material.